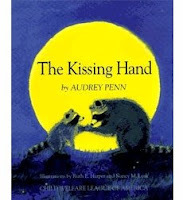 Our very first day of school we read a story with the parents called, The Kissi ng Hand, by Audrey Penn. It is an adorable story about a young raccoon going off to school for the first time. The story centers around the young raccoon and his mom. In the story Mrs. Raccoon gives Chester, the young raccoon, a kiss in the middle of his left hand and tells him anytime he starts to miss her, he can always look at his hand and remember--Mommy loves me. This is a cute story and brings tears to parents too--really pulls at the heartstrings. I know many schools read this story to begin their school year as it gives parents and children something tangible to work with during separation. On the first day we used to make a kissing hand, but time constraints have put that on hold a little. 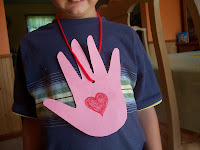 I thought it might be fun for mommy or daddy to make a kissing hand for their child if they are feeling apprehensive about going to school by themselves. I thought if this book was used on the first day with parents, as ours is, it might be nice to make a kissing hand at home and the children could wear it to school. Then they would have something concrete from you and whenever they looked at it could remember--Mommy loves me, or Daddy loves me. The kissing hand is very easy to make. You will need a piece of construction paper, marker or crayons, yarn, and tape. First, trace your hand on the construction paper and cut it out. In the center of the hand you can draw a heart, or lips--your preference. Then I used some tape in the area where I was going to punch a hole so that the paper would be reinforced there. Punch a hole and thread the yarn. Now the child has a kissing hand necklace to wear to school. There is also clear contact paper out there that you could use to cover the whole hand and make it even more durable. Don't forget though, before you go, take that little palm in your own hand and plant a big kiss on it so your child has your warmth with them all day. I hope you have an enjoyable preschool year! hi! This is a great idea. btw,thanks for letting me know about the missing .com. I have already modified that. Hello! I love this story. This really helped my daughter last year during her 1st time away from mom. We would give each other the kissing hand before she would have to detach her from my leg. Great idea to make the hand necklace!! By the way- thanks for the feedback on my blog- Creative and Curious Kids! I'd love for you to link to my site-Thanks!! I just added you to Jen's Favorite Education blogs! !